Throughout the world there are paths of significant historical, cultural and strategic implications. One such intriguing path is the Great Wall of China. The objective of the Other Path is to locate and describe the twin other of this significant path. The Great Wall of China, one of the largest building-construction projects ever carried out, stretching for nearly 2,000 miles from the shores of the Yellow Sea to the Gobi Desert, is a monumental Geographic Information Systems (GIS) mapping enterprise. This ancient technological artifact provides an excellent opportunity for creating an arena of exploration and representation uniquely enabled by contemporary GIS technology. 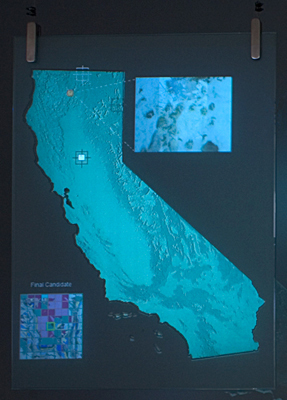 Topological data gathered while traveling the length of the Great Wall was used to perform a search through the USGS (United States Geological Survey) data for California in order to find similar topographies in which the Wall might conceivably exist, even if only as a trace from a previous a expedition. Geri Wittig was the Project Manager for Other Path. 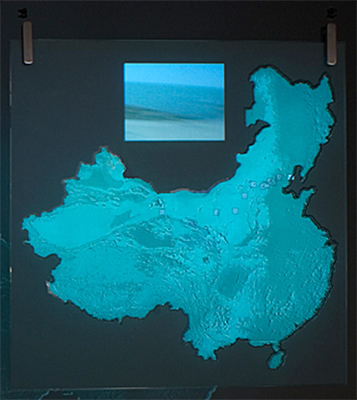 View of China panel: Glass, approximately 4x4', with the topography of China digitally etched into it and projected upon it. 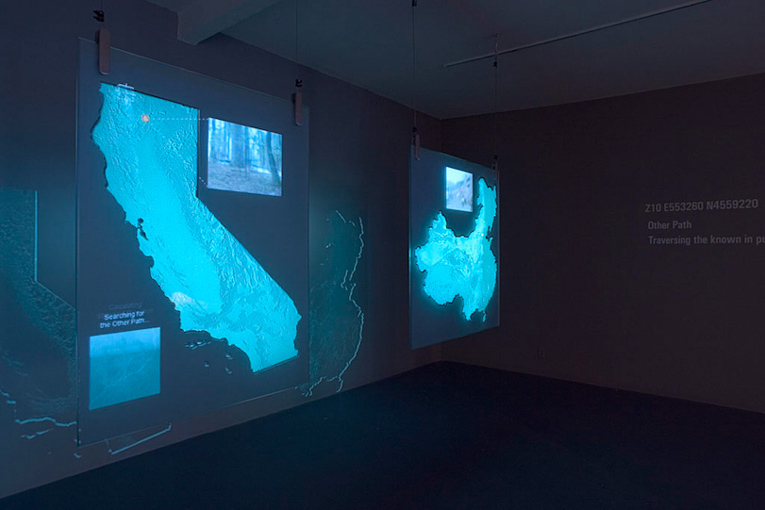 The projection includes an animation of traversing the Wall and video vignettes from the expedition. 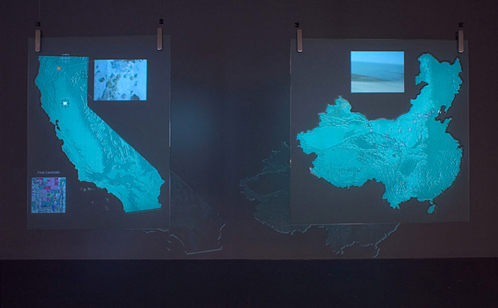 View of the California panel: Glass, approximately 3.5x4', with the topography of California digitally etched into it and projected onto it.In this case the projection shows a simulation of data mining, locating the California 'other' to the Great Wall (which was found in Northern California, not far from Mt. Shasta), and video clips of our expedition to find the Great Wall of California.